Because I’ll be using a lot of coconut milk and/or cream for South-East Asian fusion month, it’s important to begin with a simple tutorial for extracting your own coconut milk. Sure, you can use a can if need be, but I promise this will yield better results. More reminiscent of dairy milk than what you’ll find in a can, fresh coconut milk is both cheap and easy to make, with the added bonus that you’ll also have a pile of fresh coconut meat with which to play. On the coconut, at the top, are 3 marks that make the fruit resemble a bowling ball. The one that’s slightly offset from the other two tends to be the softest, so this is the one you’re going to drill into. If you’re using a drill, dig in (and if you have one, it’s definitely the easier option). Otherwise use a good sized nail and hammer it in. Just don’t follow the method in the picture above because, well, it’s just a picture. Put the coconut between your knees or have someone else hold it so it’s stable. 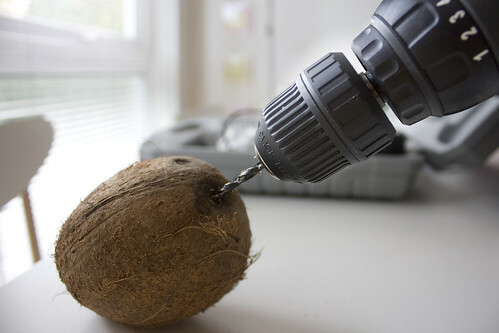 Once you’ve got a good sized hole you have two options: either shake the coconut water out into a bowl or put a second hole in the coconut to make the juice flow out easier. I always opt for the former. Once all the coconut water is out, loosely wrap the coconut in a tea towel and place on the floor (the more solid the surface, the better). Centre the hammer above the shell and bring it down hard. You’ll hear the shell crack, but you may have to hit it a few times for it to break open properly. Don’t worry if it shatters a little bit (but rinse the meat lightly to avoid getting any of the hard outer shell in the meat- it’ll do your teeth in later if you eat it). Since you’re harvesting the coconut meat to make coconut milk, it needs to be grated. 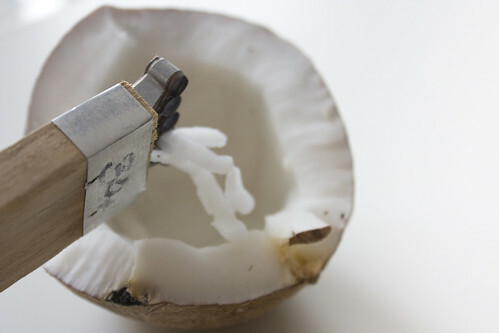 You can either use a coconut grater to get it out of the shell, or just bash it to smaller bits with the hammer so the meat falls out. The latter option is both easier and quicker, in my opinion, and also more fun because you get to keep breaking stuff. Pull the meat away from the shell and grate it. To make thick coconut milk, add 1 cup of warm water to a large bowl with all of the grated meat, kneading the mixture for a few minutes. 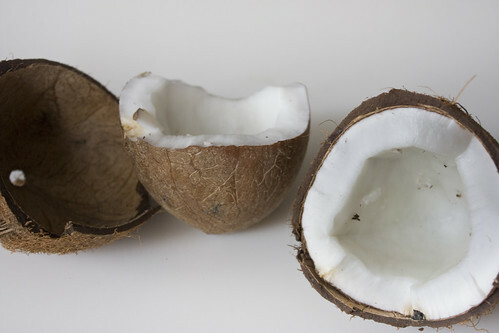 For coconut cream, halve the amount of water. Likewise, for a thinner milk add an extra half cup. 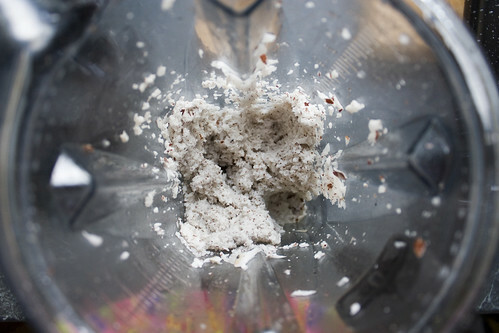 If you have a high powered blender (I made this coconut milk with my Vitamix) then chuck the chunks of coconut and the water in (no need to grate first). You could use a food processor as well, I’d imagine. 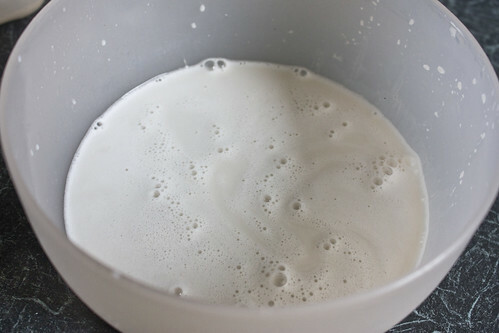 The water will turn milky white as you knead the coconut. 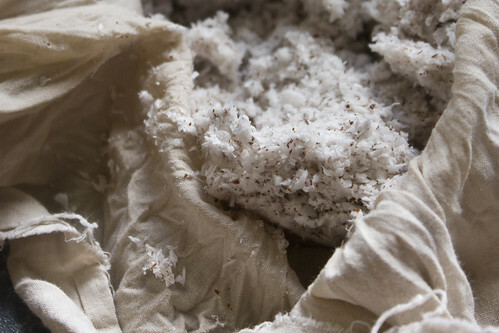 Now find yourself a piece of thin muslin (or a nut bag) and strain the coconut meat, wringing out as much of the liquid as possible. And voilà! Coconut milk, plus a bunch of fresh grated coconut for later use. great idea using a drill! I always use a cleaver, I bought one just for coconuts! I feel like I’ve learned so much just now! Any food post that features a drill is a winner. You can get bottled coconut water if you don’t have raw coconuts. That’s an awesome idea! When I move into a house that has a gas hob (okay, one day… a girl can dream) I will definitely give this a go!